Football, basketball, baseball and more. Pro sports, college sports, and fantasy sports. A sports fan writing to sports fans. On Wednesday, July 29th, I was able to go to the most historic stadium in the country.... Fenway Park in Boston. I watched the Red Sox fall to the Oakland Athletics 8 to 6. However, the fans were into it all the way to the end. When David Ortiz came to the plate representing the winning or tying run (I can't remember) the place erupted and there was hope for the Sox. 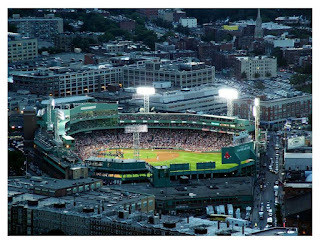 So, as I was sitting there taking pictures of the "Green Monster" and walking around the park I started thinking about just how historic Fenway park is. I tried to think of a more historic existing baseball stadium in the U.S. and couldn't come up with one. Yankee Stadium was torn down, Wrigley field is close but I don't think there is as much history as Fenway. Then I tried to compare it to the most historic existing stadiums in any sport. 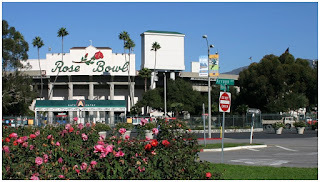 The Rose Bowl, Madison Square Garden, Lambeau Field, The Orange Bowl, Memorial Coliseum (L.A.), Notre Dame Stadium and the Boston Garden (Wow, that is two very historic stadiums in the same city) all came to mind. However, I still don't think that any of them have as much history as Fenway Park. Now my question is.... Does anyone out there agree/disagree with my assessment? Did I forget to mention any other stadiums that should be mentioned here? Alright, I'll weigh in. Being slightly biased, based on my Boston roots, I would say you are correct that Fenway is the most historic stadium in any sport. They've talked for years about tearing it down though. Hopefully that won't happen. Unfortunately, the original Boston Garden was torn down years ago, so it's out of the running, but it would have been up there as well. The Celtics had a great home town advantage just from the parkay alone, since they knew where the 1" gaps & dead spots in the floor were. I would say the Coliseum has to be up there as well. As an introduction, I am a former college football player, my brother was a college football player, my father was a football coach all of his career and I am a sports junkie. I have been blessed with four wonderful daughters who I love dearly but I realized that they don't share all of my sports enthusiasm. Therefore, I have decided to start an online sporting goods store called Head Coach Sports and an associated blog on sports so that I can share my sports enthusiasm with people who may be more interested in sports than my daughters and so that I have a "manly" outlet. Therefore, I will be posting my opinions about any and all sports that I see fit and hope to have a lot of fun along the way. In addition, I would like to have a place where people from all walks of life can comment on sports of any kind. Please feel free to comment on our blog or visit our website at www.headcoachsports.com for all of your sporting goods needs.